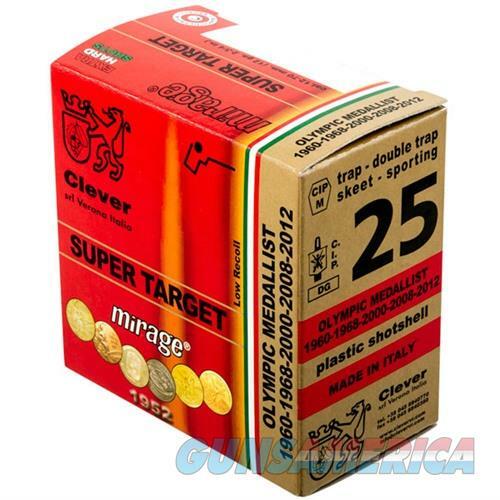 Description: Clever CMST12H75 T1 SUPERTARGET HV AMMO 12 GAUGE 2-3/4" 1-1/8 OZ #7.5 SHOT Clever-Mirage first saw the light in 1952 when four shooters and hunting enthusiast friends joined forces. Thanks to their excellent quality these products were instantly appreciated all over Italy. Being a family run business has always been the fundamental characteristic of this "made in Italy" company. All Clever munitions produced are tested under extreme conditions before ever being put into the market.